Several people I know are skilled at carpentry, metalwork, sewing, and other constructive arts. Just about the only thing I know how to make from raw materials is dinner. Early evenings, I love to close my laptop, turn on NPR, and cook. Whatever I find outside has first priority; second is what’s fresh from the nearby farmer’s market, or the organic grocery. I choose local to encourage farming infrastructure and local prosperity, and organic to avoid poisoning farm workers. When fresh vegetables are not available I use what we canned or froze last fall, foods untouched by corporate hands. This week: vegetable soup with green beans and tomatoes from last summer’s garden; Indian chickpeas from garbanzos frozen last fall; vegetarian tamales with last year’s jalapenos and cherry tomatoes, and fresh spinach and spring onions; roasted vegetables including garden asparagus and organic sweet potatoes; salads of garden kale and spinach and new lettuce. At table we say grace over the dishes, their ingredients, and the friends who helped supply them. Last night, listening to All Things Considered: broccoli-cheese souffle of farmer’s market eggs, last year’s broccoli, and milk, flour, butter, cheddar cheese, all local. And an amazing tomato chipotle soup: saute onions and garlic; add canned tomatoes and almond butter (the recipe said roasted pecans, which would have been exquisite if I had some), and half a chipotle pepper. Hit it with a hand blender. Add last year’s corn. I wish you could taste it. It all took about an hour. Last summer a friend introduced me to a woman who had turned her corner lot into an edible Eden, outlined in strawberries and sweet potatoes. 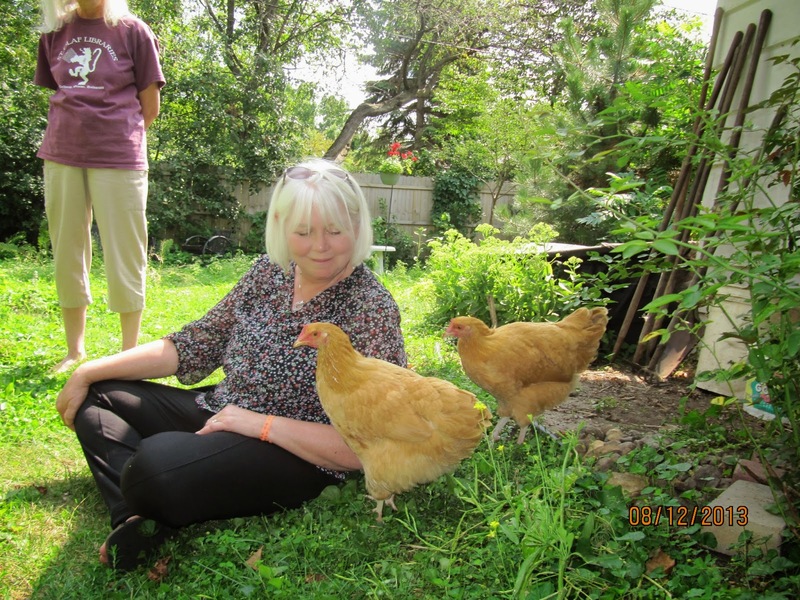 When I sat down, her two chickens climbed into my lap. She inspired me to mix more foods into our own flowerbeds (see Monday's post on apples, berries, greens, and herbs). 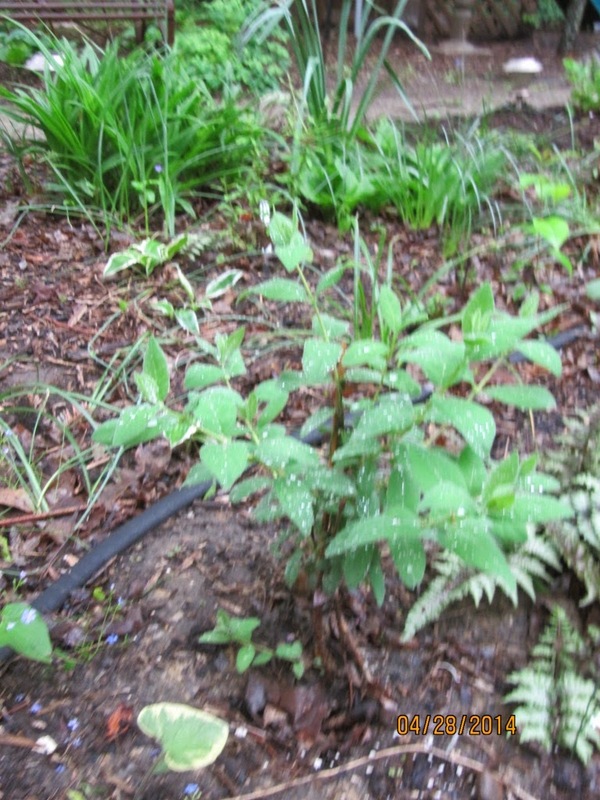 I also learned that the daylilies that keep expanding are edible, as are the redbud blooms. Each adventure invites another. Some call cooking work. I call it creativity. Eating out is fun sometimes, but most restaurant fare is not worth the losses to pocketbook, principles, and diet. Prefab grocery store meals in boxes, cans, and frozen trays are high in price, packaging, salt, corn, and unpronounceable substances. Cooking makes us stronger: healthier, aesthetically richer, calmer, more accomplished. It’s one of our most reliable introductions to our own community, both its people and its plants. Through daily food choices, we vote for the future we desire. I was curious to see what would survive the harsh winter. 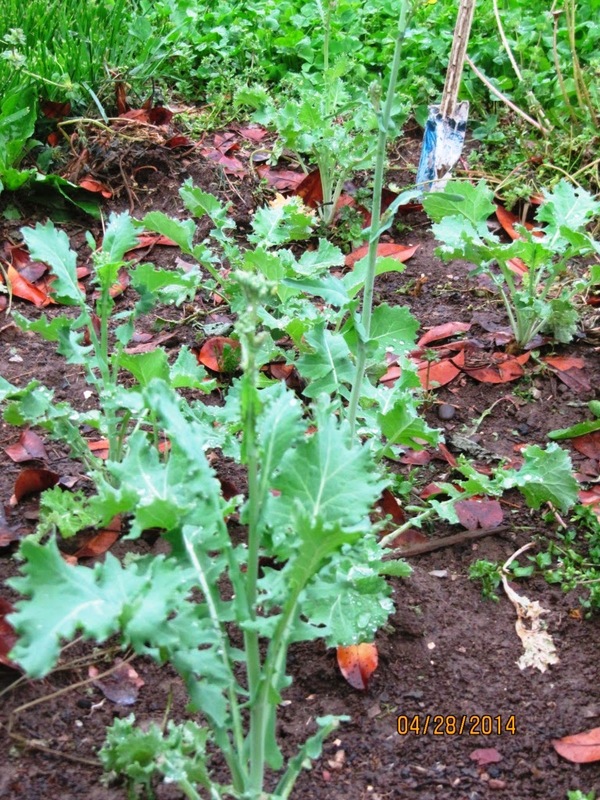 Several greens flourished in the garden, including some kale that is still producing salads. 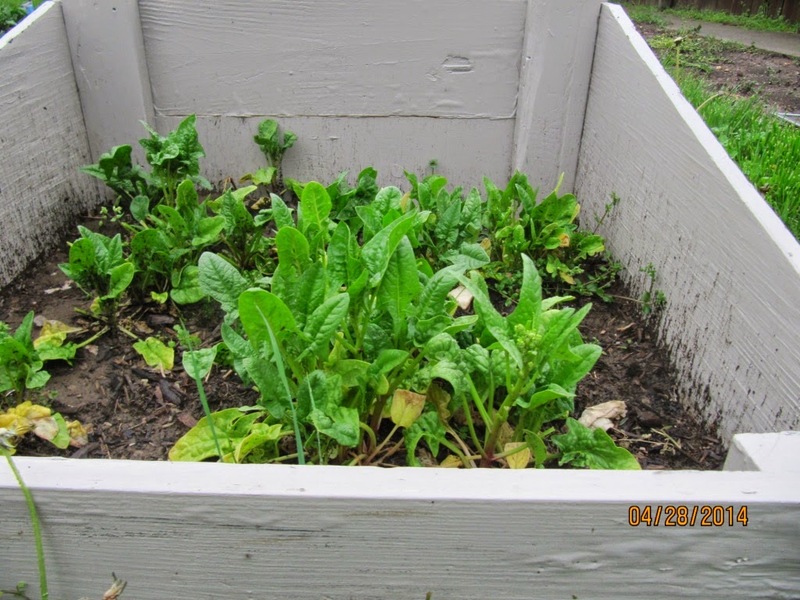 The spinach that slept through in cold frames, often under piles of snow, leaped up toward the sun when we removed their storm window rooftops. 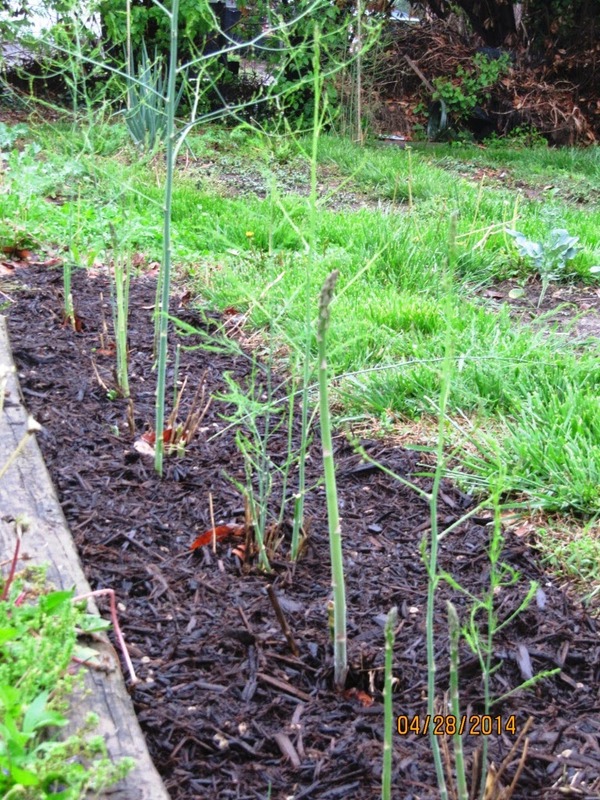 Fat asparagus stalks begged to be plucked and roasted, and we complied. 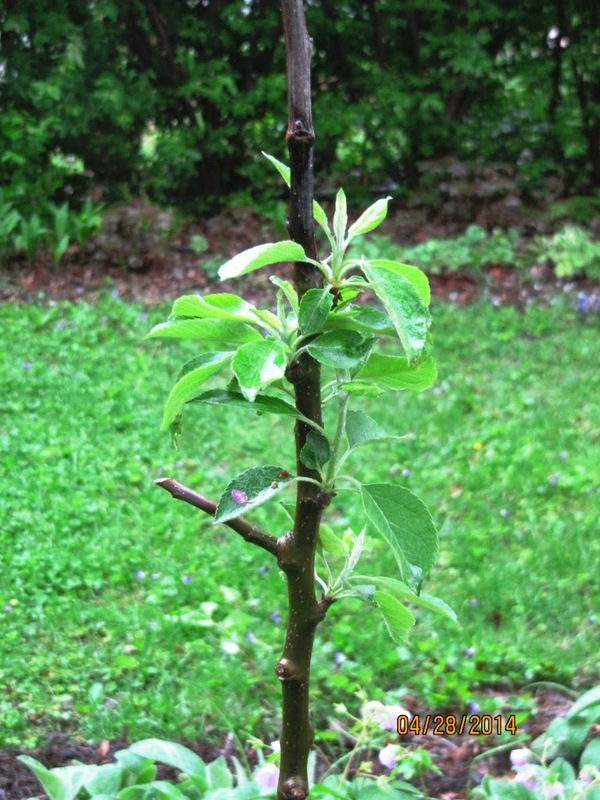 Every day in April I inspected two new apple trees—lifeless sticks when planted last fall—and watched buds swell and leaves fluff out. They may grow branches by summer’s end. The blackberries we thought had died rose triumphant, Christlike, portending summer breakfasts al fresco. 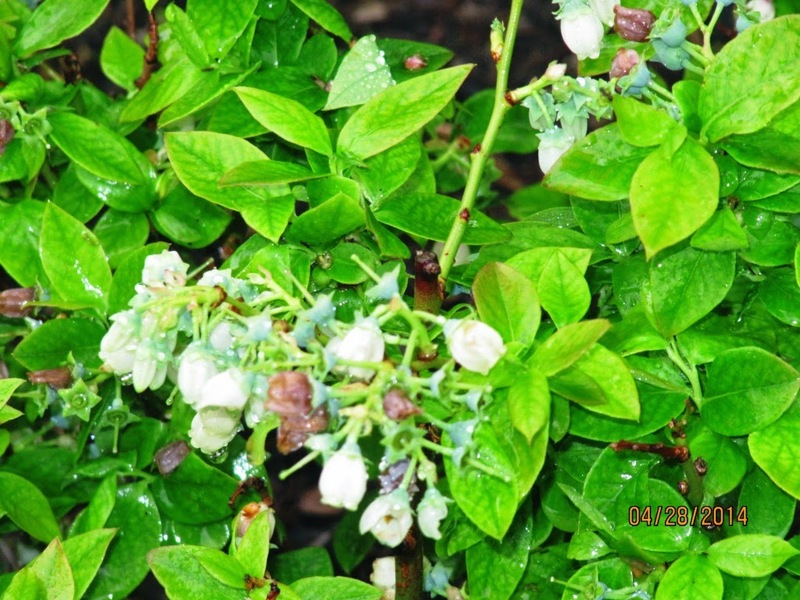 The coffee grounds I dumped on the blueberry patch through the winter have now resurrected as flowers that might just turn to fruit. 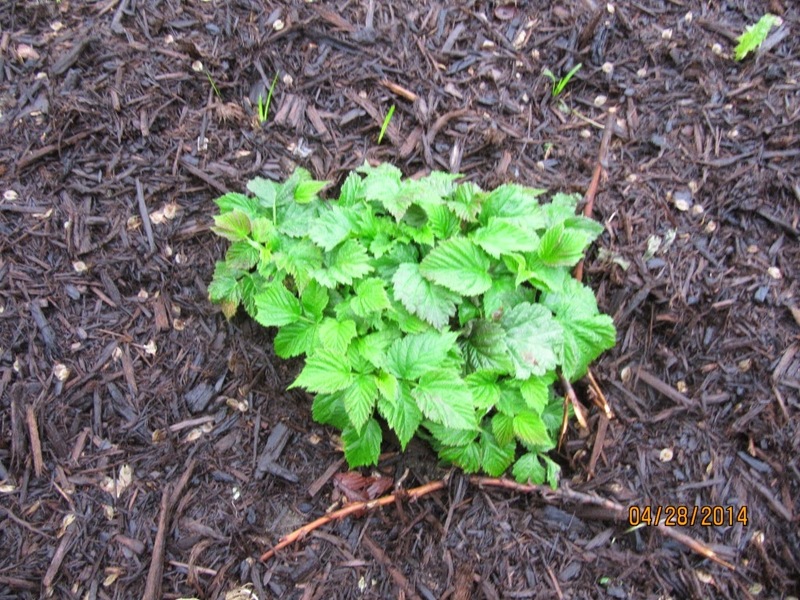 The strawberry plants scattered throughout the flowerbed last fall are blooming too, and the honeyberry and gobi berry sticks that I planted and promptly lost are now beginning their ascent into bushdom. The rosemary unsurprisingly died, but I replaced it with one I’d kept inside. The sage that died won’t be missed. 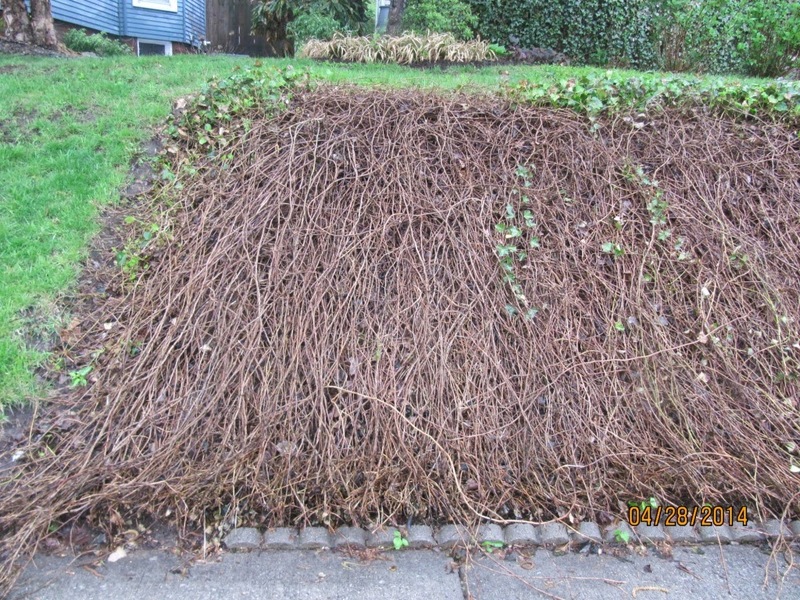 Very surprisingly, the relentless, invincible English ivy that dominated the northern hillside—keeping the yard from eroding into the street, but also harboring mosquitoes and weeds—croaked. Every hydrangea died to the ground, but now they’re preparing to give it another go. 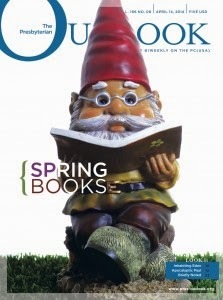 The first review of Inhabiting Eden is out in the April 14, 2014 edition of The Presbyterian Outlook. 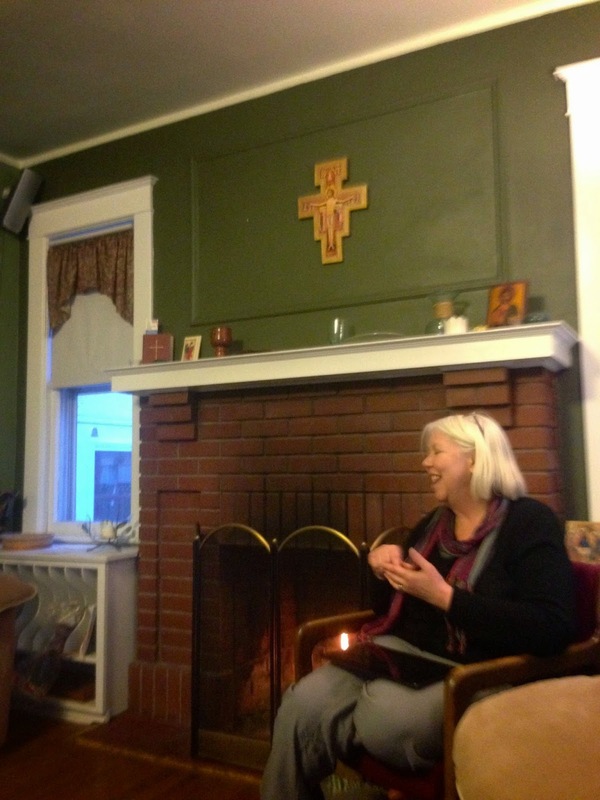 The author, Rev. Susan Zencka in Stevens Point, Wisconsin, says that she tested a couple of chapters with a group from her church, and they wanted to keep on reading. It's always gratifying for a writer to realize someone "gets" what you are doing. Rev. Zencka says, "The book is gentle in tone.... Often when I read books about the state of the earth, I feel guilty and ashamed for not doing enough. After reading Tull's book, I feel empowered to do more." Thank you so much! What a joy it was to preach this morning at Louisville Seminary for the Festival of Theology. 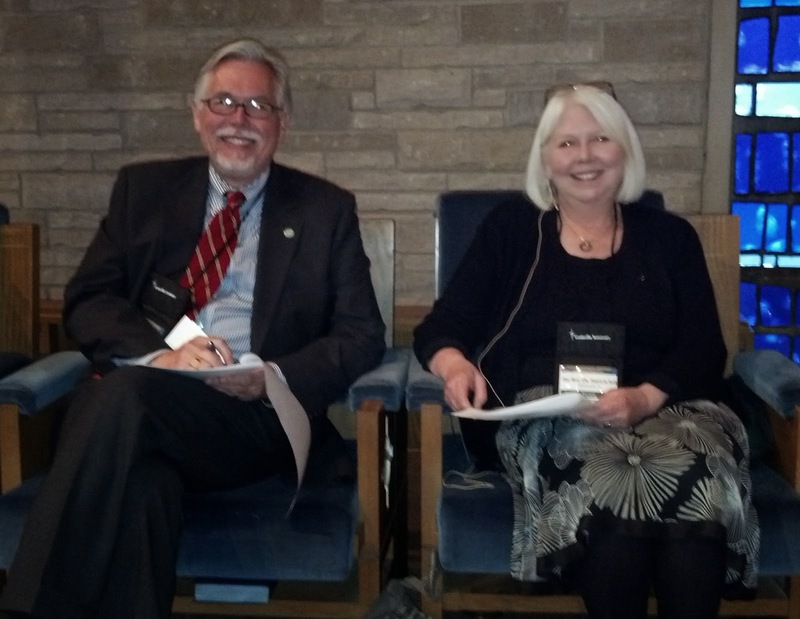 Marian McClure snapped this shot of President Michael Jinkins and me just before we began. I spoke today about the problem of wrapping our minds around the changes we know we need to make, and the help we find when we look to forebears who faced other life-shattering challenges to habit and viewpoint, such as the Apostle Paul on the road to Damascus, William Wilberforce introducing the abolition of slave trade in the British parliament, Lucretia Mott starting the women's rights movement in Seneca Falls, and Rachel Carson speaking out to the public on DDT through her book Silent Spring. "The world we take for granted is founded on decisions to keep turning from a familiar but flawed present toward destinations only imagined, unprecedented, unknown, decisions risking failure, moves we only regret if we fail to make them." Now to finish preparing tomorrow's sermon on Genesis 1 and 2. If you still hold stock in Exxon, it's time to sell now. Ben Adler at Grist.com reported Tuesday ("ExxonMobil: Carbon caps? Fat chance. 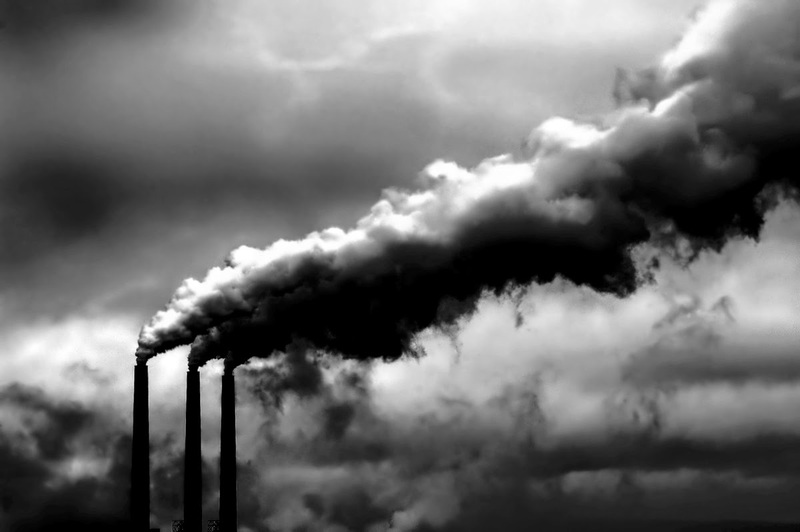 We'll just keep on drilling") on Exxon's Monday shareholder report, which argued for business as usual, based on the assumption that the U.S. government will be unable to compel the necessary 80% reduction in greenhouse gas emissions. 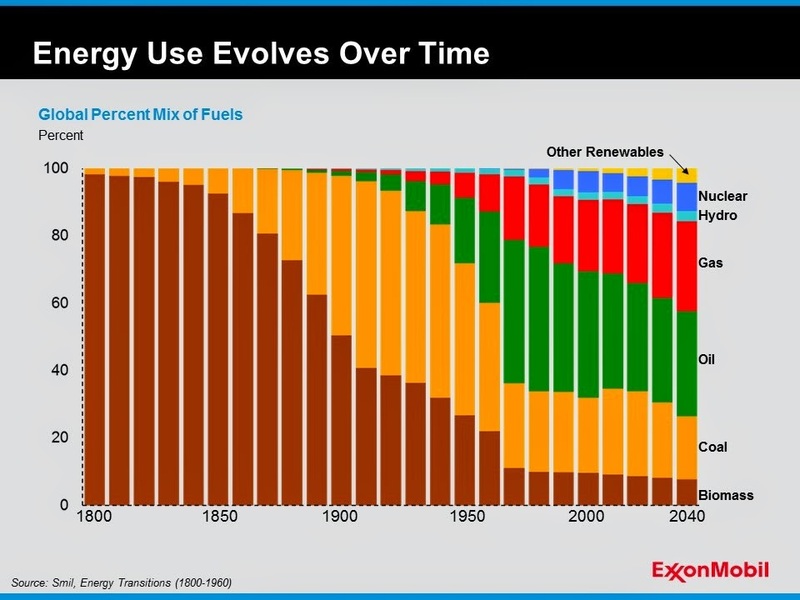 Exxon's report itself is worth perusing: evidently the megacompany admits human-caused climate change could be a bit of a problem, but plans to address it by increasing conservation in its drilling operations, expecting that renewables will comprise only 5% of the world's energy mix even by 2040. The good news, as Adler points out, is clarity. For anyone still hoping shareholder activism might succeed, Exxon has laid its cards on the table, signaling loudly that the health of future generations is not this company's concern. But for those disappointed by the oil and gas industry, the person to watch is Dr. Mark Jacobson, professor of Civil and Environmental Engineering at Stanford University. He and his associates have been rolling out detailed plans to convert California, New York, the whole U.S., and in fact the world to 100% water, wind, and solar energy. Watch his lecture concerning the whole planet here. And see his 50-state plan, including profiles for each state, here. These plans naturally mean large up-front costs for turbines, PV panels, and other improvements, but Jacobson projects that the financial returns from improved human health alone will quickly reward these investments. For instance, according to his New York proposal: "If New York switched to water, wind, and sunlight, air pollution-related deaths would decline by about 4,000 annually and the state would save about $33 billion...in related health costs every year." The only thing more remarkable than his proposals is that anyone anywhere is still wondering whether the pricetag is worth it. I've been out speaking a good bit since returning from Israel in February. The GreenFaith Ground for Hope conference was exciting and well attended in both Lexington and Louisville. Since then I've been around to three Indiana towns preaching and teaching, as well as in Louisville, and I've spent the last few days in New Jersey speaking to church groups and college and seminary students at Rutgers and Princeton. Coming up this Saturday is an event in Louisville cosponsored by Kentucky Interfaith Power and Light and Louisville Presbyterian Seminary (see below). And on Monday and Tuesday at 11:30, I will be preaching at Louisville Seminary's Festival of Theology. The worship service is free and open to all, as is the book signing on Tuesday afternoon at 5:00 at the Winn Center. 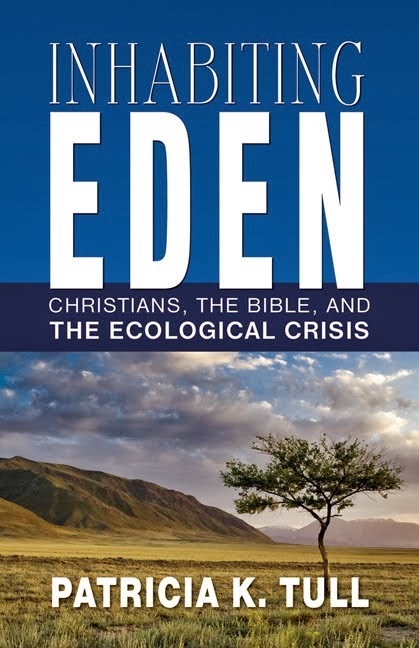 Amazon now has six great reviews of Inhabiting Eden, and I hear that more are coming elsewhere. Saturday, April 5, 2014, 1:00 – 3:30 p.m.
Light refreshments will be provided at this interactive workshop.